All of my projects are experience-focused—grounded in my career start in interpretive planning. Interpretive planning and content development for museums, zoos and interpretive centres immersed me in content-first design and interdisciplinary collaboration. I love the world of interpretive planning—especially working with people who are deeply invested in the stories they have to share with the public, which makes them engaged partners and hard-driving task masters with high expectations for the final product. I owe my own high standards to my work with and for these devoted professionals. I know that sober second thought and a fine-toothed comb make for a better final product that we can all be proud of. Working within budget, space, political and conceptual constraints to come up with creative communications solutions. Conducting workshops, interviews and in-depth research to uncover stories and experiences for new and renewed institutions. Managing multiple team members with varying skillsets to complete complex interpretive planning projects. Interpreting difficult and sometimes abstract topics in engagingly written, easy-to-understand text. Contributing to projects that require a functional knowledge of design, from colour relationships to architecture. Gathering complex and even competing requirements and information and creating a cohesive set of recommendations from them. 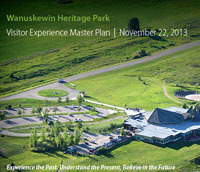 Following our 2013 Master Plan, Wanuskewin undertook a capital campaign that is now complete. Exhibit design and story development is underway for 4000 square feet of new exhibits as part of the organization's expansion and renovation. I am honoured to contribute content development to this important and spiritually nourishing project. 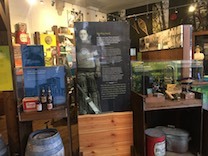 As Fernie Museum exhibits hit their five-year birthday, we were delighted to be asked to come back to make a few updates and additions. Some new digital story kiosks were added, as well as some new bios of Fernie Boosters and refreshed artifact cases. Congrats Fernie! Your museum looks fantastic! 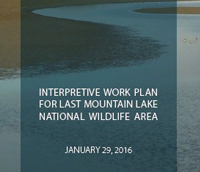 After delivering a full Interpretive Master Plan in 2016, we have been working with Last Mountain Lake to implement our recommendations as their budget allows. 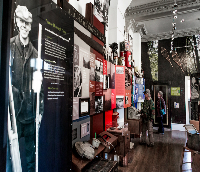 In 2017 we provided new interpretive panels for their visitor information centre as part of Canada's 150th. We also completed new self-guided trail guides for the Grassland and Wetland Trails. 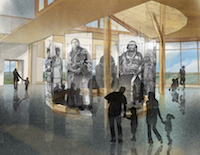 Parks Canada has engaged AldrichPears Associates and Tall Order Communications to provide a concept and design for new exhibits for the Fort Walsh VRC. The design is part of a design-build project, involving 3DS Interactive Exhibit Fabricators. The new exhibit, the first upgrade since the building opened 40 years ago, will open in September 2017. The first phase of implementation of 2016’s interpretive plan for Last Mountain Lake NWA and MBS is the design of eight new moveable interpretive panels that will begin their life cycle in the existing exhibit kiosk at the north end of Last Mountain Lake. 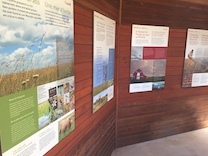 When the new interpretive kiosk is built in the next two years, these panels will be used on the portable trailer that will be used for educational programs. Tall Order partnered with Kiko Communication Design to write, design and create print-ready files for production. 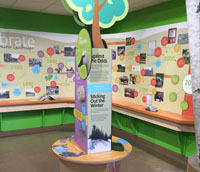 Lead consultant on a team of exhibit designers, landscape architects and ecologists engaged to conduct a visitor experience plan to increase visitation and engagement of Canadians with nature at National Wildlife Areas. Interpretive text writing for four natural history galleries: Bugs, Wild Alberta, Changing Landscapes, and Gems & Minerals. The new museum is scheduled to open December 2017. Guest curator at the Western Development Museum to develop the story, recommend artifacts and provide interpretive writing for a new exhibit for Western Development Museum’s 1910 Boomtown. 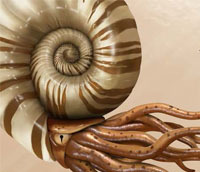 Writing of interpretive text for 30 animatronic specimens and three interactives for a traveling exhibit on modern, extinct and mythical sea creatures, first opening at Sea World Gold Coast in Australia. Saskatoon, Saskatchewan Research and interpretive planning for a business and concept plan for Wanuskewin Heritage Park. The report will be key to Wanuskewin’s fundraising efforts and will drive future plans and designs. Fernie, British Columbia Research, interpretive planning and writing for new exhibits in the Fernie Museum’s new building. Edmonton, Alberta Research, interpretive planning and writing for a new entry sequence to the Edmonton Valley Zoo. The Wander is an experiential introduction to the zoo, placing visitors first squarely in their own parkland habitat, and allowing them to draw connections between where they live and other parts of the world. Saskatoon, Saskatchewan Research, interpretive planning and writing for a new discovery centre that tells the history of the Saskatoon Forestry Farm Park & Zoo, a National Heritage Site and the only accredited zoo in Saskatchewan. 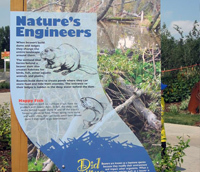 Partnered with landscape architects in Saskatoon, Saskatchewan to provide interpretive planning as part of an award-winning park development plan. The park has a remnant of the original Moose Jaw Trail running through it, so part of park development includes commemorating and interpreting the heritage of the trail. Saskatoon, Saskatchewan Participated in concept development for a new Meewasin Valley Centre. Charlottetown, PEI Conducted workshops and research to determine how and where to best tell the story of Confederation and the history of the Confederation Centre of the Arts in various locations throughout the CCOA building. Summerside, PEI Research and interviews were conducted to determine the feasibility of a Mi’kmaq cultural centre in PEI. The project culminated in a concept document that recommended a phased approach that succeeded in telling the story of the Mi’kmaq culture, collecting stories from the Mi’kmaq people themselves, and building capacity within MCPEI to run a sustainable cultural centre. Charlottetown, PEI Developed the interpretive components within a comprehensive signage project for downtown Charlottetown. San Bernardino, California Research and interpretive writing for a 9,500-square foot gallery to be added to the existing San Bernardino County Museum. Exhibits focus on local geology and seismology and their influences on the landscapes and paleo-environments in the region. Saskatoon, Saskatchewan Research, interviews, content development and writing for a study on a historic remnant of Saskatoon’s riverfront. Saskatoon, Saskatchewan Research, content development and interpretive writing for the first key feature of the River Landing development in Saskatoon. Saskatoon, Saskatchewan Prime consultant for the development of a plan incorporating heritage elements at the Forestry Farm Park & Zoo Historic Site with existing park and zoo activities.